Krishna relaxes on the couch and watches a movie after returning home from soccer practice. He speaks to me about how his sisters still enjoy Sabdkosh (Hindi soap operas) and music videos from Nepal, but he has moved on and prefers American TV shows and action movies. Krishna now goes by "Kris" and will be entering 8th grade this year as a 14 year old. He speaks of joining the U.S. military but complains about how his parents will never allow him to leave them. Nevertheless, he plans to go to UTSA for college. The Acharya home is filled with signifiers of identity. As a refugee family, they hold on to as much as they can, from old family photographs, to new religions. Their apartment is adorned with Hindu alters and posters, as well as statues and photos of Jesus, the new American god they have skeptically accepted into their home. Hita, the father of the family, removes his boots after returning home from his landscaping job. Hita and his wife Gita met through an arranged marriage when Gita was 14 years old, and Hita was 22 years old. They got married in Bhutan and then moved to a refugee camp in Nepal during Gita's first pregnancy. Kris shows me a photo of him and his family from Nepal. In 2008, his mother filed for refugee status in the United States, and in August of 2009, Kris moved to San Antonio, Texas, with his three sisters and mother and father. Their broader family of aunts, uncles, and cousins, suddenly became isolated thousands of miles away. Necklaces and bangles hang on Hita and Gita's bedroom wall. The women in the family enjoy dressing up in their traditional clothes as much as they can. Bangles are especially vital to dressing up for special occassions, such as weddings, bridal showers, and holidays. Sita looks out onto the back patio as the sun sets. The 18 year old senior dreams of becoming a doctor and returning to Nepal to help the people from her home. 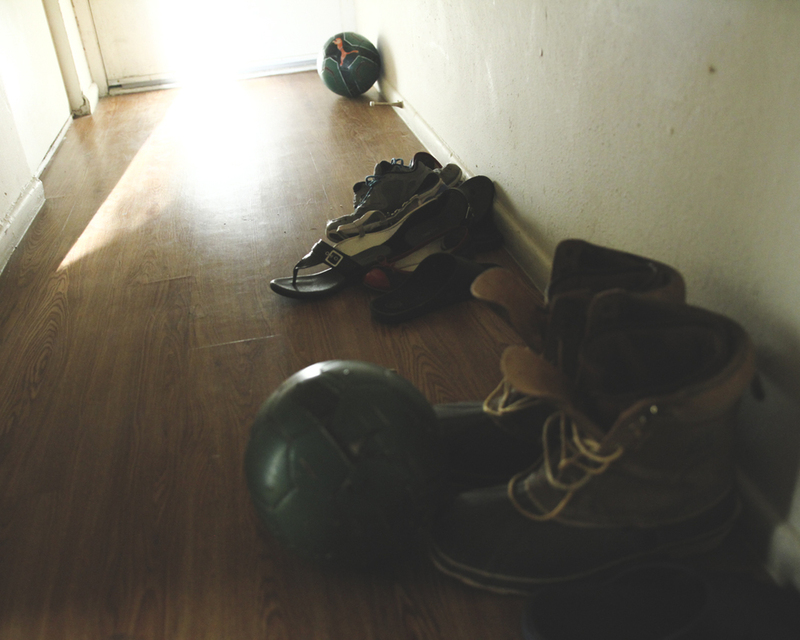 The entrance into the Acharya's apartment is filled with the shoes and soccer balls of visitors. The apartment complex is a hub for refugee families from all over the world- from Somalia to Burma to Iraq. The climate is both tense and communal. 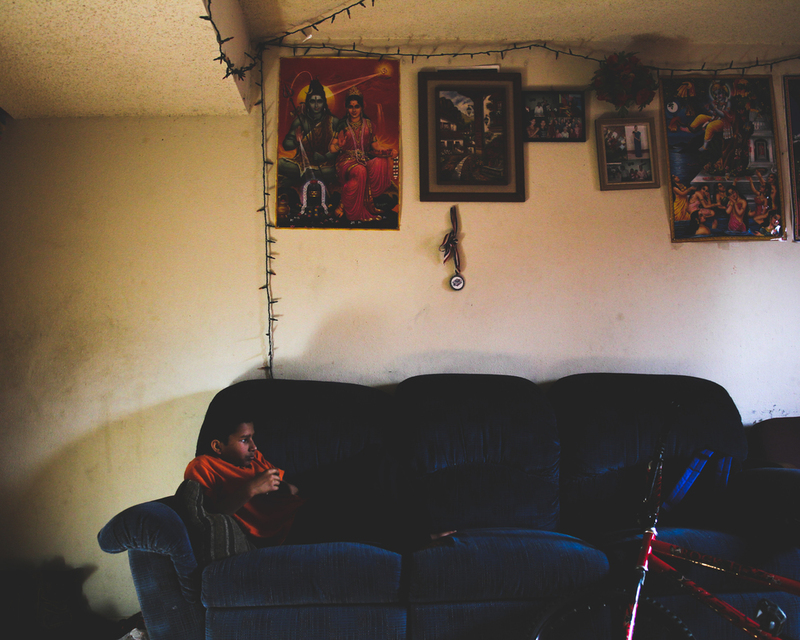 Racism and gang activity are both prevalent in the area, but families still try to uphold cultural values, such as keeping the door open to visitors and having friends over for dinner or tea. Tulasha and Hem live in a larger apartment and are able to maintain a guest bedroom for visiting relatives, such as Hem's mother or Tulasha's older sister, Ishura. Ishura is the oldest child in the Acharya family and lives in New York with her husband's family. She and her husband moved northeast when they got married. Soon Ishura's husband found himself in money trouble and gambling and committed suicide. Ishura is a 23 year old widow and has a two year old daughter named Maria. Hari, 15 years old, poses for a picture her sister Sita is taking to my right. Her fiesty attitude and passionate personality have made her transition to the United States an interesting one, causing her to get tangled in the drama of her apartment complex and high school. She has a relentless drive for justice and dreams of going back to Nepal to open an orphanage there. Whoever comes home first in the evenings is responsible for starting dinner for the family, so Sita starts slicing potatoes as soon as she gets home from school. On her arms are two tattoos of her initials Sita has cut into herself. Tattoo and skin markings are heavily correlated with religion and identity in Hindu culture. 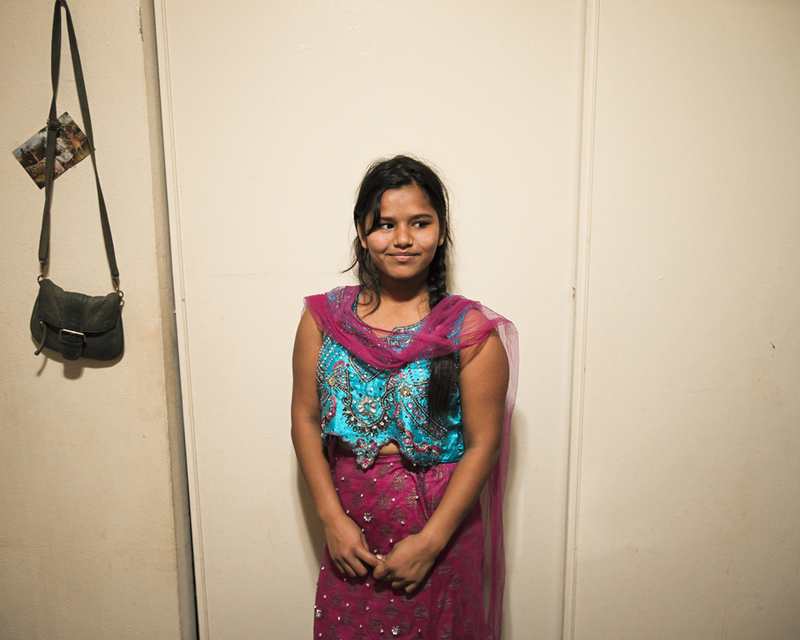 Tulasha is the oldest daughter who still lives in San Antonio close to her parents and siblings. She is 21 years old and married with two sons, Aaron and Aarush. As she holds Aaron on her lap, she calls her husband, Hem, to come and watch the children while she gets ready for work. 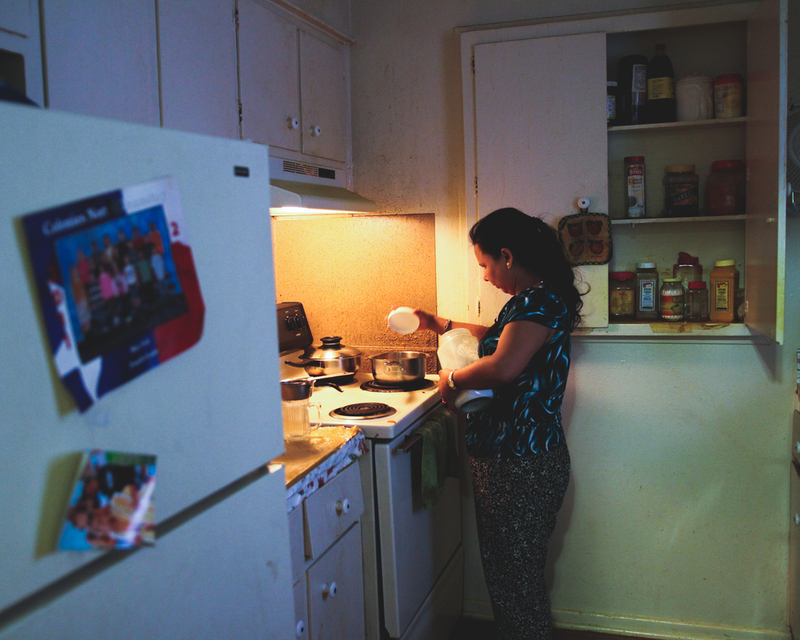 She and her husband both work at the hospital nearby– Hem in food service and Tulasha in housekeeping. It has been seven years since the Acharya family moved to the United States as refugees. When I met them in 2011, they refused to speak english or use silverware. They have come a long way in adapting to life here, and have shown me the internal and external complexities refugees wrestle with in regard to identity, pride, and loyalty. If you drive south down Interstate 10 towards San Antonio, Texas, you pass a few things. You pass my hometown – Boerne, Texas. You pass Six Flags Fiesta Texas, Camp Bullis Military Base, and Leon Springs, Texas, the home of George Straight and the San Antonio Spurs. A few miles south is Exit 561. This exit leads you to one of the largest medical centers in Texas, but also to one of the most dense and diverse refugee communities in Texas. Since 2004, nearly 5,200 refugees from 28 nations have been resettled in the Alamo City, according to Department of State data, including more than 1,200 from Burma, nearly 1,100 from Iraq and 1,200 from 13 African nations. Local experts have estimated the current refugee community number at about 10,000 to 12,000, and growing (San Antonio Current). The refugee community spreads throughout multiple apartment complexes in the area. You know you are approaching the area when you start to see middle eastern and indian grocery stories on each corner and children bicycling around holding their infant siblings and soccer balls. Families in this community are struggling through the 180 day period the U.S. allows them to become “self sufficient.” Both parents are working, children are fighting for school access and learning english culture, and the youngest of the families are left to the care of whoever happens to be home during the day. The climate of the area is chaotic, eerie, crowded, diverse, and tense. 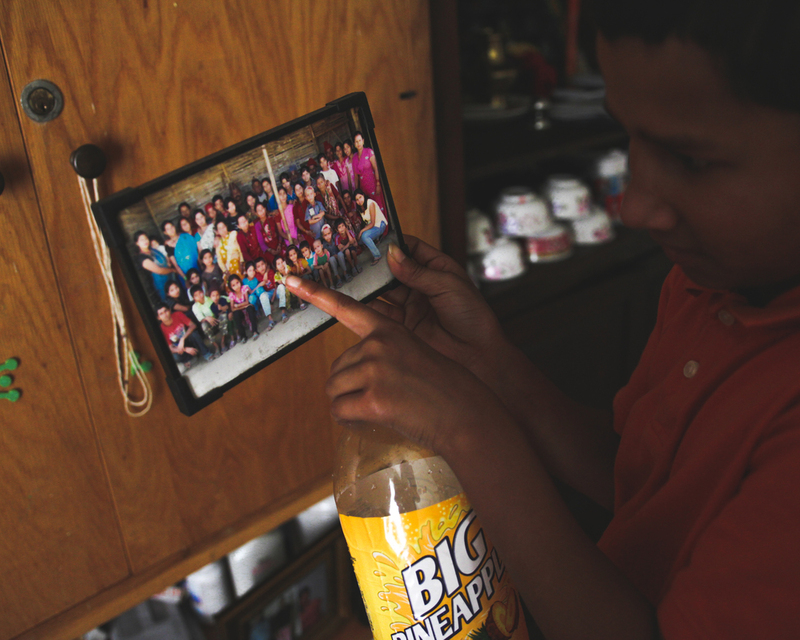 Within the chaos of this community, I met the Acharya family - A mother, father, and their five children who moved to San Antonio from Nepal in 2009. As my relationship with them developed, I understood the humanity, strength, and individuality of refugees on a new level. Photographing them has shown me the challenges surrounding adapting to new surroundings as a refugee. How does one maintain and reconstruct their identity at the same time? How does one embrace their surroundings, yet remain proud of their native culture? In photographing the Acharya’s, my goal is to provide an intimate perspective into the lives of refugees, to highlight each individual and communicate their experience adjusting to a new place. Through intimacy and storytelling, Everything is Different humanizes the refugee situation in San Antonio while touching on aspects of place, religion, and self-sufficiency.